The school year has just started, but Common Ground 10th grader Anthony Mitchell has already left the classroom behind. On the very first day of class, Anthony and his classmates met up with Kevin Ewing and Nikki Katz of Baobab Tree Studios for a workshop on storytelling — the first of six sessions they’ll spend together this semester. 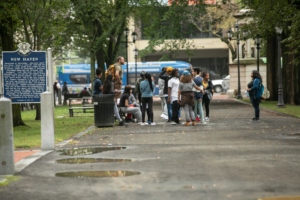 Anthony and his classmates explore the New Haven Green with local historian Colin Caplan. Photo credit: Chris Randall. 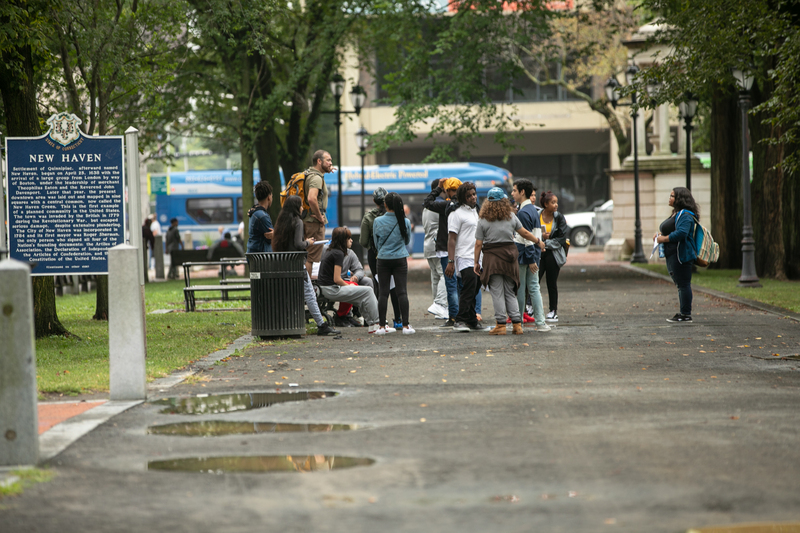 A week later, all 60 Common Ground sophomores were down on the New Haven Green for a photo scavenger hunt with local photographer Chris Randall, a tour of downtown with historian Colin Caplan, and a descent into the crypt under Center Church with Michele Reynard. One of the meeting rooms at New Haven City Hall became their meetup point for lunch and an end of day debrief. Diane Brown welcomes students to the Dixwell Branch of the New Haven Public Library. Across all these classes, students are working on the same big projects and performances. In the first unit of the course — which runs through the start of November — all this work will come together into a web site that shares students’ growing understanding of their city. Later in the school year, students will produce interactive theater pieces that explore justice and change in the city, create art and issue briefs that address climate change, and create public service announcements and research briefs aimed at creating a healthier community. Stacy Spell, retired homicide detective and Newhallville native, talks about Yale’s growth into this historically African American neighborhood. In fact, this isn’t the first time that Common Ground’s Class of 2020 has broken new ground. Last year, they were the first class to experience our integrated 9th grade core — combining math, science, social studies, and English to take on a series of quarter-long units off study. 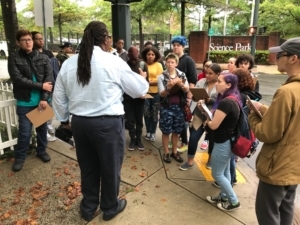 While their 10th grade curriculum focuses on New Haven as its primary learning lab, their 9th grade experience got them grounded in Common Ground’s 20-acre site. They gathered and published family food stories and cooked with food from our farm; built community and academic skills by taking on survival challenges in the woods of West Rock; used poetry, scientific facts, the historical record, and mathematical reasoning to combat implicit bias and explore their own identities; and debated how to improve their school. Does blurring the classroom walls actually help students learn, or just sound good on paper? The 10th grade core is just starting up, so the strongest evidence we have at the moment is the feedback of students like Anthony, Dayanara, and Imani. But the 9th grade core is now going into its second iteration, so has generated a year’s worth of data and experience. If the goal was to provide more experiences that connected students to their places and communities, we succeeded! 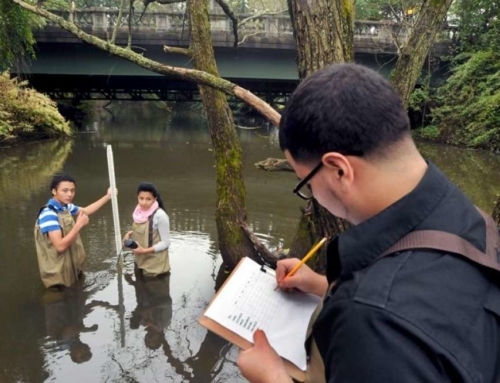 The percentage of 9th graders who have learning experiences focused on their local community and environment — including field trips, projects, research, and reflection — increased substantially from 2016-17 to 2017-18. For instance, the percent of students who say they “always” or “frequently” take on projects focused on their community or local environment increased from 22% in 2016-17 to 52% in 2017-18. The percent who say they always, frequently, or sometimes take on field work focused on the local community and environment increase from 41% to 81%. In 9th grade, the class of 2020 made greater gains in math than 99% of their peers nationally — growing at 3.4 times the rate predicted, according to results of the NWEA Measures of Academic Progress. In language usage, their growth put them in the 90th percentile. Nine in 10 of last year’s 9th graders earned enough credit to move to the 9th grade, up from 87% the year before. 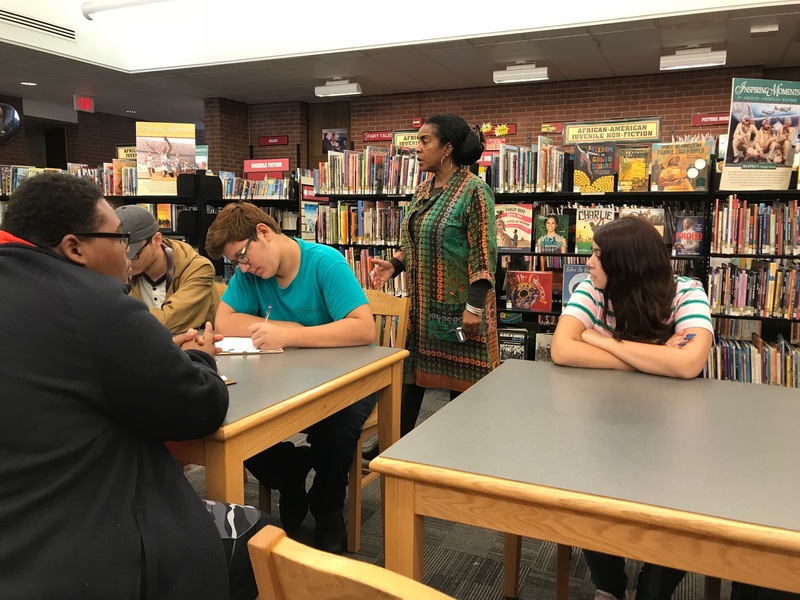 This is a particularly big deal given that these students were challenged with 8 total classes — four in the core curriculum, plus four other classes, including a second math class, while previous 9th grade classes only took 5 classes each semester. In a survey at the end of the year, we asked these 9th graders about how experiences at Common Ground had impacted them beyond academics. The percentage of students who agreed or strongly that, “because of experiences at Common Ground, I am a leader” was 50% — up from 32% in the previous 9th grade class. 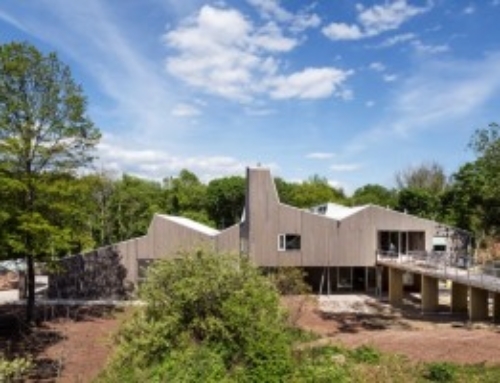 The percentage of 9th graders who said experiences at Common Ground had caused them to be someone who cares about the environment was 57% — up from 46% the year before. Students were also more likely to call themselves change agents, and care about social justice issues, than the previous class of 9th graders. At the same time, the 9th grade core teachers have also made some big changes in response to students’ experiences last year. Students’ big gains in math and language usage weren’t matched in reading, where students’ growth rates put them in the 67th percentile nationally — so the teaching team is intentionally integrating more reading strategies and aligning skills development work across classes. And they also want students to be able to spend more time exploring connections across subjects and doing real work — so cut the number of big units that students will experience from four to three.